The condemnation this week of protester Mikhail Kosenko to forced psychiatric treatment has sparked debate that Russia is returning to the Soviet practice of punitive psychiatry to silence its critics. 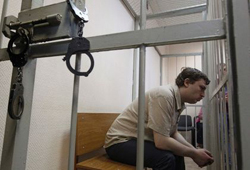 Kosenko, who had been taking medication for several years for a mild form of schizophrenia, was given a new, more serious diagnosis during his 16-month arrest, and declared dangerous and in need of indefinite isolation from society in a report cited by prosecution. Russian veteran rights campaigner Lyudmila Alexeyeva called Tuesday’s verdict against 38-year old Kosenko “a return to Soviet psychiatric persecution of dissidents” and said she will complain to the World Psychiatric Association. Amnesty International also condemned the verdict as “abhorrent use of punitive psychiatry to silence dissent” and a breach of trial procedure. Kosenko, who was convicted of assaulting a police officer at an anti-Vladimir Putin protest on May 6, 2012, was declared insane and dangerous due to his “paranoid schizophrenia” by Russia’s Serbsky Institute in July 2012. The same institute was behind a wave of diagnoses used to lock-up Soviet dissidents in the Soviet era, with the practice becoming especially widespread between mid-1960s and the breakup of the Soviet Union.